The Civilian Marksmanship Program (CMP) was created to develop and maintain safe and competent marksmanship skills, particularly among youth. This match satisfies one of the requirements to purchase a surplus firearm from the CMP program. This year.s rifle marksmanship clinic features the traditional training on the M-1 Garand service rifle. 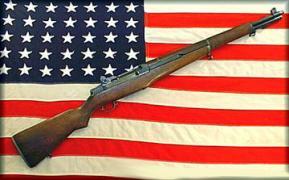 This service rifle was used by our military in both World War 2 and the Korean War. Instruction is also provided on the AR-15 if the student brings one. All shooters need to bring eye and ear protection. Look at the April newsletter for more details including prices. Participants receive a Certificate of Completion for purchase of a M1 Garand. Come to our range for a fun day of shooting. We provide rifles, ammunition, eye and ear protection and shooting coats. Make Check payable to "Riverside Gun Club"